Orange Park Medical Center, originally constructed in 1974, has undergone numerous expansions over the years. The facility commissioned TMP to design a new entrance lobby, providing a new arrival point for the facility which has grown to almost 300 beds. The original main entrance was actually located under an existing patient tower with low visibility upon entering the campus. 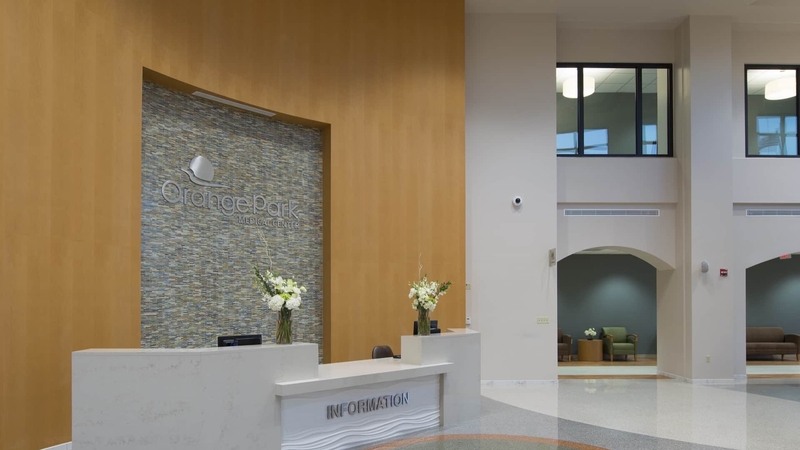 The biggest challenge was to give the facility a welcoming new face for both visitors and patients while remaining consistent with the facilities existing aesthetics. The new two story space provides an abundance of natural light through punched openings along a curved wall complimented by curtainwall at the two ends of the lobby. The use of terrazzo flooring and wood tones on the interior provide warmth to the space and create a welcoming environment for visitors. New entrance drive and canopy. New chapel with a raised platform, a tile accent wall and stained glass windows. Elevator lobby for future patient tower. The expansion will provide a new 44 room Emergency Department that includes both an addition at the front of the hospital and the renovation of the existing ED area. The new addition is approx. 13,168 sf and includes a new ED walk-in entrance and vestibule, ED waiting room, Ambulance vestibule and two Trauma rooms, public toilets, outpatient admitting, nurse station, 11 Exam rooms and support. The layout of the rooms and bathrooms complies with the most recent Healthcare guidelines. The renovated space is approx. 14,000 sf and includes a nurse station, new CT room, 10 existing exam rooms with new finishes, 1 new Psych Hold room, 3 multipurpose exam rooms that can flex to Psych rooms and 17 additional exam rooms. The project also includes a new entrance canopy for the ED walk-in/ Outpatient entrance, a new Ambulance canopy totaling approx. 5,600 sf and a new 1,400 sf mechanical penthouse on the roof of the addition. The new addition will be designed to expand horizontally and vertically 4 additional floors, plus a penthouse in the future. Site work for the project includes a new helipad that will be sized to accommodate larger helicopters from the local Naval Air Station and Coast Guard Station. This coincides with the facility pursuing the Level 1 Trauma status. Additional site work includes new handicap parking near the new ED entrance canopy, a new drive cut near the southeast corner of the site, additional parking near the helipad and a new parking lot on the western most part of the site containing 173 parking spaces.